A realist work of art is one in which real things, people or events are depicted as if they are real. The aim with realist drawing or painting is to construe as close as possible an accurate representation with whatever the artist is depicting.Realism goes back to Renaissance attempts to accurately conceive the world in order to better understand it, which flourished between the 14th and 17th Centuries. Realism arguably influenced many baroque painters such as Velazquez (1599-1660) and Rembrandt (1606-1669) although they compromised reality for the sake of experimentation with oil paint as a medium. Realism underwent resurgence in the 20th Century for its social aspects: Realism aimed to present reality un-beatified by the artist. For socialists, and for fascists, the artist was a corrupt agent of the bourgeois class, which covers over social problems by making everything appear better than it was in reality. However, this kind of realism (as with ‘socialist realism’) often ended up being manipulated by political interests as propaganda, and barely reflected reality at all (apart from in an approximate semblance) but, rather, a sanitised version of it. Realist painting re-emerged from this situation in the latter part of the 20th Century as painters such as Chuck Close (b.1940) and Gerhard Richter (b.1932) began to paint the reality that the camera perceived: They would paint direct accurate copies of photographs. Interestingly this presents not reality, but a representation of it. Often Richter would paint blurred photography, reproducing the faults as they appeared. One result is to point out how far removed from any direct reality we often are in a media age, as well as pointing to paintings survival even in an age when reality may be seen to be better depicted by photography. Other than those artists mentioned many artists employ degrees of realism in different ways. Arguably, all art is a depiction of reality, just as all artworks reveal something about the artist in their relation to the world. However, the term realism has been used specifically to depict reality as it appears objectively to the observer. Interestingly, this implies that more importance should be accorded to a material reality than to the reality of the emotions or dreams. This is perhaps one of the few instances when art comes close in its attitude to science, yet one must remember that realist artwork make up very little of what constitutes art itself. One must also consider tat even a realist artwork may be manipulated to express a particular social motive. 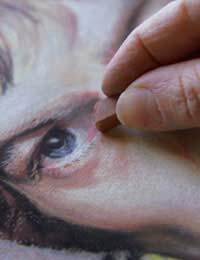 Making realist paintings and drawings can be painstaking. Whilst some people have a clear natural talent for realism, for many people improvements clearly come as the result of dedication and patience. The only way to really develop realist skills in drawing and painting is to work slowly and to observe minutely the detail of what you are trying to represent. With time the image will start to appear on your page and canvas. If you do not succeed at first try not to be too hard on yourself, noting rather those aspects that have gone well. From here you can build on your skills.